Molly Bloom is a real life criminal who ran an illegal high stakes poker game in Hollywood and then New York. She raked the game, laundered money for the Russian mob, and if not illegally then unethically, exploited men with a gambling addiction to enrich herself. Eventually she was caught up in a Federal investigation into the mob and without spoiling the ending, this film sees her battling those charges while recounting her history. Bloom is played by a characteristically high class Jessica Chastain, more or less reprising her role in the superb MISS SLOANE. Her Bloom is smart, no-nonsense, and unsympathetic - a woman whose profession is clearly both illegal and unethical - and the game is to guess whether underneath all that selfishness they're a moral compass. Bloom's lawyer, played by Idris Elba, and the director/writer Aaron Sorkin, are convinced. They give us a film in which Bloom is portrayed as a heroine who refused to sell out her players and ruin their lives by giving the Feds her records. This might be more convincing if played with some nuance - if we didn't have bombastic TWELVE ANGRY MEN speeches from Elba - and if it didn't contradict everything we see of Molly in the film. Yes, she might offer to get a player help with his addiction, but only after she's soaked him for days on end. Sorkin shows us someone who is a predator on the weak - but he tells us that after all, she really cares about their families. We're also asked to believe that Bloom, as smart as she is, as rapier-fast and witty as her Sorkin dialogue is, didn't realise that when Russian mafiosi turned up with cash in satchels that they weren't money laundering - that she wasn't aiding and abetting pretty nasty crimes from happening. Sorry I'm just not buying it. The other thing that jarred was Sorkin's trademark mansplaining. We get both the lawyer character and Bloom's father (Kevin Costner) try to explain to her and us why she did what she did. There Sorkin goes again - setting up a smart female character only to cut her off at the knees. Thus, for all the brilliant acting and snappy dialogue, I just couldn't get into a film whose central character premise I didn't buy in to. I just didn't believe in Sorkin's version of Molly. And that made the film a long - too long - dull slog through the legal machinations, and an ending that felt unearned. If you want to see Chastain playing a strong female character who actually owns her fate, doesn't need men to explain it to her, in a tightly paced, beautifully photographed movie, check out MISS SLOANE instead. 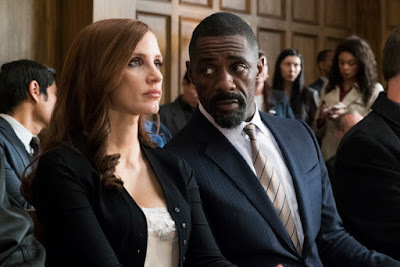 MOLLY'S GAME has a running time of 140 minutes and is rated R. In the UK it is rated 15 for strong language, drug misuse and brief violence. The film played Toronto 2016 and was released last year in Croatia, the Netherlands and the USA. It opened earlier this year in the UK, Ireland, France, Argentina, Greece, Hungary, Kuwait, Portugal, Singapore, Lithuania, Poland, Romania and the USA. It opens on January 11th in Russia, on Jan 19th in Sweden, on Jan 25th in Australia, on Jan 26th in Finland, on Jan 27th in Mexico, on Feb 2nd in Taiwan, on Feb 22nd in Brazil, Denmark, Thailand and Norway, on March 1st in Hong Kong and on March 8th in Germany.